Companies using a value metric grow at more than double the rate of those who don't. 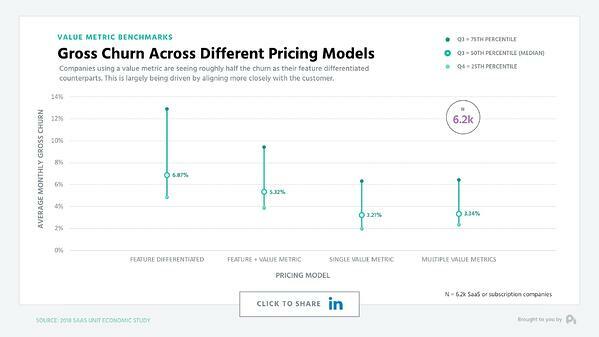 Gross churn rates of value metric companies are less than half of those using feature differentiation. Companies using a value metric see a higher proportion of their revenue come from expansion. For one, it’s hard to deny the impact of value metrics on a business, particularly when it comes to growth. 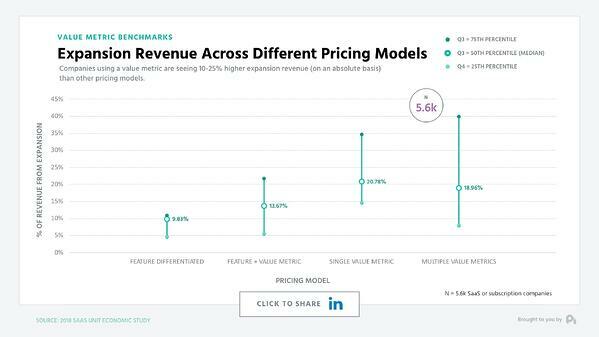 When we compare companies utilizing some sort of value metric versus those who are strictly utilizing feature differentiation, those who have value metric based pricing are growing at nearly double the rate as their feature differentiated counterparts - and the gap is widening. This growth differential for value metric companies is because you’re baking expansion revenue directly into your pricing model. 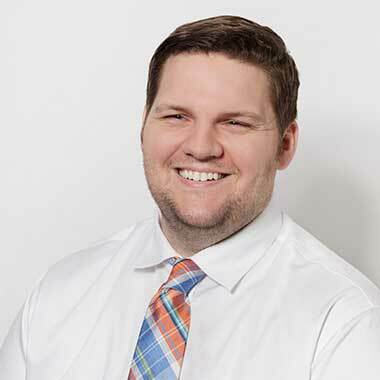 If you’ve aligned your value metric correctly with your target customer base, then as they use more of that metric, they’ll naturally be inclined to pay more, because they’re getting more value. Plus, you won’t have to fight tooth and nail to convince them to upgrade for a feature they probably don’t need. 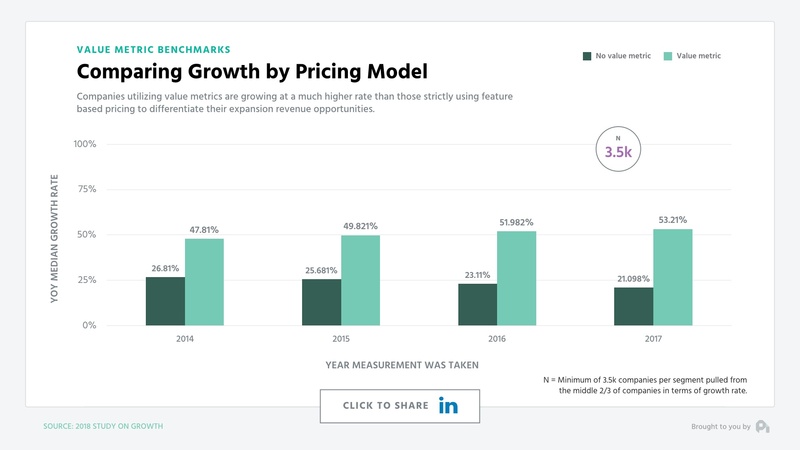 Gross logo churn rates of those companies who are utilizing a value metric are actually half those of those pricing based on feature differentiation. Plus, just raw expansion revenue as a proportion of overall revenue is higher - with value metric companies seeing roughly 10 to 25% higher expansion revenue on an absolute basis. Clearly a value metric is the way to go, but what are some signs you’ve hit the right one? First, I’d make sure you’re seeing this type of throughput from an expansion revenue perspective. If you’re seeing less than 15% of your revenue from expansion, you’re probably using the wrong metric. Ultimately, the beauty of the subscription model is that with more and more technology coming into the billing mix, we now have the ability to fulfill the dream of commerce, which is to bake the relationship of our users directly into our pricing model, allowing a symbiosis to germinate and grow as that user continues to be nurtured by the value we’re providing. Well, that's all for now. If you have a question, ship me an email or video to pc@profitwell.com and let's also thank Zeal for sparking this research by clicking this link to share on LinkedIn. We’ll see you next week.